Some days as I age I lament my lost enthusiasm. All winter working week I am longing for time to lay aside commitment in favour of passion. I pine for my patch, like Monty Python’s Norwegian Blue pining for the fiords. I count the hours of day job and website chores, of shopping missions or ferrying the mother-in-law to chiropodists; dreaming of waders and woodpeckers when I should be researching or fundraising for the dba. Then the day dawns dreary, the sun struggles to lift the fog or sleet blurs the windows. Then the warm duvet is so much more attractive than a biting east wind; dreams so much better than imagined reality. As I age, the duvet is gaining ground on cold bird hides. Yet the alarm clock of passion rings and I rise, wipe the sleep from my eyes and drag my sorry arse staggering into the world, scope in hand to the car. Then scales fall from my eyes and I see my goal clearly through the weather. The wind could bring divers by the headland or the mist could bring down migrants and soon I’m scanning the ocean for skuas or panting toward the viewing ramp at as fast a limp as the arthritis allows in the hope of a late fishing bittern or an early rising rail. “Hold hard!” I hear you, dear mythical reader, cry, ‘what’s so grumpy about that? The lesson is that whilst I lack a show of enthusiasm I still have passion burning inside. Recently I was talking to a friend who runs a small Kent gallery called ‘Birds, Birds, Birds’ who said that he is really surprised that in the houses of keen birders there is little showing that gives any clue of their hobby. Looking round my house you will find every inch of wall covered in bird paintings; my study lined with bird books; the grumpy birder’s bungalow is cluttered with porcelain parrots or wooden waders. Visitors chorus… ‘you a twitcher then?’ I’m not ashamed to wear my anorak with pride… even my car has Bird Fair stickers and a ‘Please pass, I’m Birdwatching’ plaque. Well, what makes me scream abuse at the TV threatening to withhold my licence fee is passion replaced by formulaic ostentatious enthusiasm. 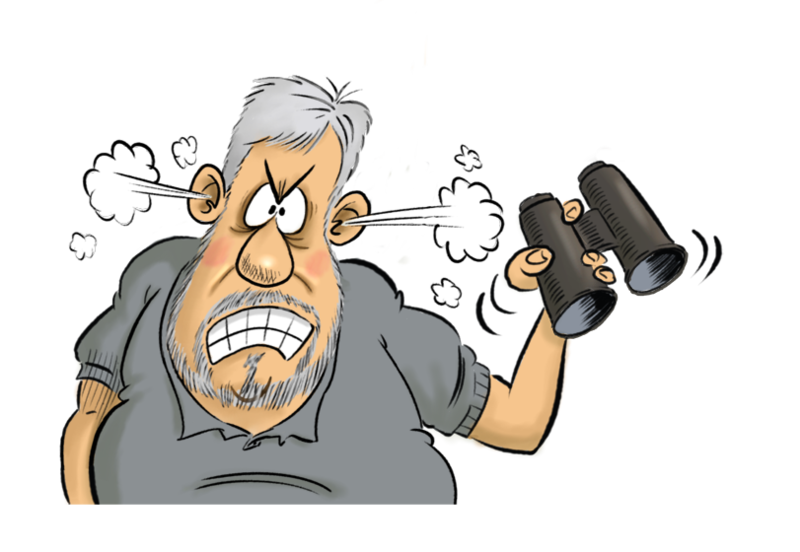 The media labels all birders sad anorak-wearing twitchers that make train-spotter’s yawn; they use the same sad formula making their tame birders show unseemly exaggerated enthusiasm. I have had it with Nigel Marvin walking to camera wind-milling his arms, or running from a CGI dinosaur to show how committed he is… all it shows is that he should be committed – to an asylum. Do we need Charlotte Uhlenbrook crouching behind a bush beaming at us with ever-arching eyebrows? Why must Saba Douglas-Hamilton run bare-foot through acacias daring the thorns to prove she is mad for wildlife? Who needs Jonathan Scott in a jeep, almost in tears, telling us how a leopard is in mortal danger anthropomorphised with a name like ‘cuddly’ or ‘spots’? Did we ever need Bellamy screwing up his face, squeezing his shoulders together to convey his love of the environment – I think not! The latest generation of wild world professional promoters seem even worse; all overtly eager enthusiasm and screaming parody of passion owing more to Disney than Darwin. I recently heard a BBC Radio 4 presenter squeal like a teenaged girl, ‘oooh, that’s reeeeeally horrible’ when looking at the outstretched foot of a goose barnacle – who said the BBC isn’t dumbing down! Do you remember Howie Watkins enthusing a generation of kids for wildlife… well he gave up the limelight to do real conservation work for a local authority. Out of the lime-light Bellamy risked gaol to preserve Tasmanian trees. Uhlenbrook spent years saving primates in steaming jungles well away from cameras – all passion with a capital ‘P’! So forgive my lost enthusiasm for cold mornings and frosted binoculars but never imagine that my passion burns less bright or my anger at human despoliation is diminished because I don’t throw my arms about and stare wide eyed into a camera lens. Can someone tell all media people that 90% of people are not stupid; they do not need false enthusiasm and constant beaming at the camera to understand the importance of conservation or the beauty of birds? We don’t have to be weirdoes to love wild places. Mind you, speaking as a bit of a nutter, aren’t birds brilliant!